This species, growing to 50mm, is one of the largest, most common sand snails found on sand-and mud-flats along the eastern and southern coasts of Australia. Like other sand snails, this is an active predator, preferring bivalve molluscs (especially tellins and clams) but also preying on other snails and in fact other species of sand snail. The animal burrows through surface layers of sand in search of prey. It uses its large foot to secure victims while the special drilling apparatus in the mouth forms a circular whole in the victim’s shell. 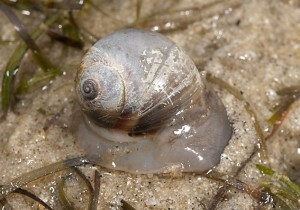 The Leaden Sand Snail produces large, crescent-shaped egg-masses, composed of clear jelly and thousands of embryos. Such egg-masses are often confused with jellyfish, but are entirely harmless and should be left alone. Indigenous: Eastern and southern Australia.